In the first few months or so after Hurricane Katrina, the Happy Talk Band, which performed today at the New Orleans Jazz Fest, was one of the only musical acts you could see regularly in New Orleans, such as they were, anyway. Bandleader Luke Allen worked daily shifts, often doubles, at the Circle Bar that September and October of '05, and played raw, raggedy shows there with a catchall version of his scattered band. Allen's songs - already yearning, messy tales of the boozy, messy lives his friends and customers lived, on barstools, in New Orleans before the storm - felt truer than ever as we hurried to finish our drinks in time to get home before the National Guard curfew. The version of Happy Talk that performed at the Lagniappe Stage today at the New Orleans Jazz Fest is partly a product of Katrina attrition and band member-shuffling. Early on, Allen's tunes were folky, with stand-up bass and lap steel; now, former members of the Morning 40 Federation, the New Orleans Bingo Show and Alex McMurray add searing rock lead guitar lines, punk-rock bass, organ and crashing drums. Those players each started with Happy Talk as pickup members - after five or so years together and two albums, they're unavoidably now the band. Out of all the acts who have been fixtures of the Bywater scene from the late '90's till today (the 40's, Bingo!, Quintron, McMurray and others) Happy Talk has seemed, in its way, the least ambitious. They gig consistently, but don't tour or self-promote much at all, quietly self-releasing three albums of Allen's tender paeans and bitter ballads about drinking, love, hurt and New Orleans. The traditional set-closer, Jimmie Davis' "You Are My Sunshine," turns into a punk shoutfest: nobody can deliver a line like "You have shattered all my dreams" quite like Luke Allen. 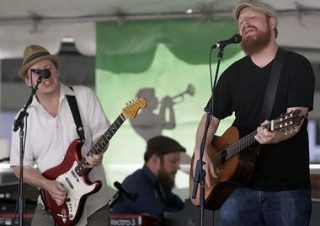 At the Lagniappe Stage today, the standing-room-only crowd boasted more than a few clear old-school fans, who screamed and whispered along, hollering for more after the penultimate song. Happy Talk hasn't hustled for fans, but it's got them in droves. Allen has been playing some of the same songs for over a decade, since he performed solo with a guitar: with the now-regular new band, those songs are now as loud and gloriously untidy as the feelings and the people they describe. With band members' other commitments less pressing - the Morning 40s are technically broken up, though they gig once or twice a year - this would be a good time for Happy Talk to reach for a little more.